Would you like to help with translations? https://altair-gql-translate.surge.sh/ Click here. A graphQL client for making graphQL queries to a graphQL server - similar to Postman but for GraphQL. There&apos;s a chrome extension and a firefox add-on. There are apps for mac, windows and linux users as well. You can use altair with an express server using altair-express-middleware. Read more about how to use this here. You can use altair with a koa server using altair-koa-middleware. Read more about how to use this here. You can add GraphQL variables to your request. Variables make it easy to use dynamic values in your queries. 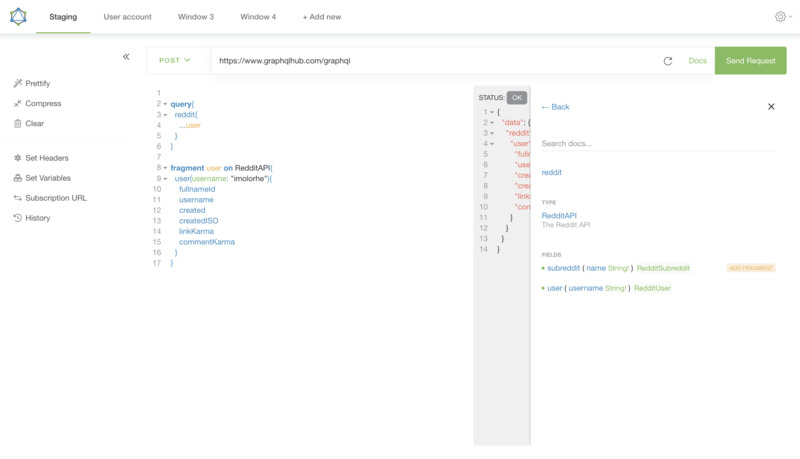 You can view the GraphQL schema in a nicely displayed manner with information about the various kinds of queries, types, arguments available to you and some description (where provided) of each of them. This is powered by the introspection capabilities provided by GraphQL. This needs to be enabled from the GraphQL server for it to be available. You can also search for a particular item in the docs as well. Useful for when you&apos;re not sure where a particular field, type or query is in the schema. You can use binary files as variables to upload them via GraphQL to server (if it implemented the GraphQL multipart request specification). You can view a list of your recent queries that you make in each window, so you can easily go back to a query you tried previously. You are not limited to only one window at a time but you can have multiple windows open to work with multiple different queries at the same time. You can also name the various windows (by doubleclicking the name) and arrange them however you like to make it easier to work with them. You can test your GraphQL subscriptions without any worry. Just provide the subscription URL and start the subscription, and you would get each message as they are sent once you&apos;re subscribed. You would also get a notification when you are away from the app (desktop apps only). This is very handy when developing apps that use the realtime feature of GraphQL, like chatting ang gaming applications that need realtime feedback. Currently, GraphQL subscriptions has been implemented by the Apollo GraphQL team. You can export the query you are working on and import the .agq file into another device (also supports drag and drop). This is also useful for sharing queries with variables and headers with other members of your team. Is there a feature that is missing? You can let us know by creating a new issue or you can add the feature by creating a Pull Request. Run yarn start for a dev server. Navigate to http://localhost:4200/. The app will automatically reload if you change any of the source files. Run yarn build to build the project. The build artifacts will be stored in the dist/ directory. Use the -prod flag for a production build. Run yarn build-ext to build the chrome extension files. The extension files will be stored in the chrome-extension/ directory. Run yarn build-electron to build the electron apps. The apps will be stored in the electron-builds/ directory. Run bundle exec jekyll serve. Run yarn test to execute the unit tests via Karma and the end-to-end tests via Protractor. To get more help on working with the project, check out the Angular CLI README. See anything that needs improving, create an issue. This project was built using Angular, an awesome opensource project from the folks at Google. The desktop apps were built using electron, another awesome opensource project from the folks at github.